Like none other on the market, SpeedyMoto's Ducati water pump housing is a revolutionary achievement at water pump protection. 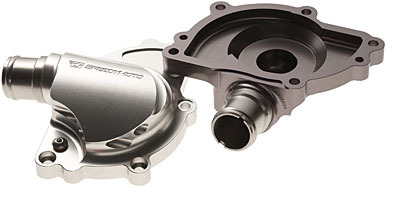 No one has ever developed a complete replacement water pump housing until now. 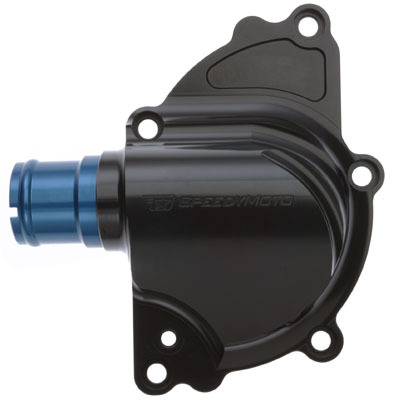 SpeedyMoto's water pump housing replaces the fragile, cast aluminum stock unit. The pump is designed to protect the vulnerable left side of your Ducati power plant. Proven to increase the flow and efficiency of your cooling system, our housings act as a heat sink, netting up to 10% cooler running temperatures compared to the stock piece. 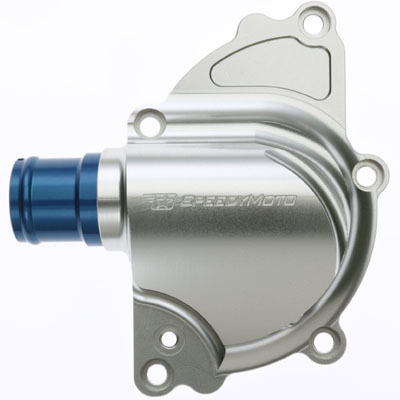 Milled from T6 billet aluminum, the SpeedyMoto water pump housing is the toughest pump housing available. We offer two designs to fit both liquid-cooled Ducati power plants. Choose from the SpeedyMoto pump for the venerable Desmoquattro model ‘98-01 and for Ducatis ‘02-current. Our kits come complete with stainless bolts and hardware as well as easy installation instructions. * was designed to protect the vulnerable left side of your Ducati power plant. * has proven to increase the flow and efficiency of your cooling system. * is easy to install. * includes new stainless hardware. * fits perfectly and won't wear holes in your bodywork. * offers leading edge style and functionality for your Ducati. * acts as a heat sink, netting up to 10% cooler running temperatures compared to the stock housing. Note: Will not fit older models with 4-bolt patterns.